Massachusetts Cold Spring Orchard Research and Education Center. 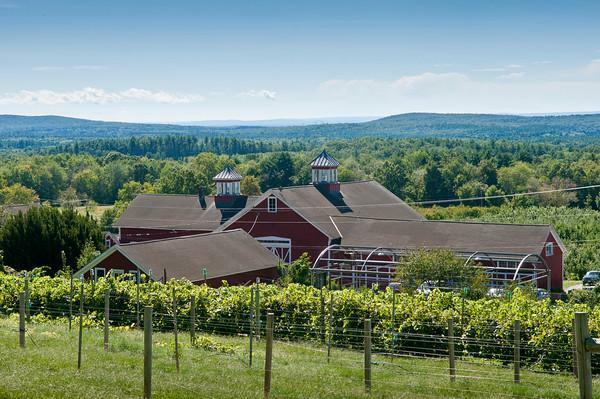 BELCHERTOWN — Cold Spring Orchard, anchored by a picturesque red barn on a verdant central Massachusetts hillside, looks like a classic New England u-pick operation and farmstand — and it is. But the University of Massachusetts Cold Spring Orchard Research and Education Center — its full name — is also a facility where researchers are hard at work addressing sustainability, pest management, and climate change, in the name of growing the best possible fruit. The orchard of tomorrow, the table grapes that may someday be grown throughout the state, the next celebrity apple variety, the solutions to blight and scab and mildew: All are being trialed, tested, and tracked here. And though many Cold Spring visitors simply pick or purchase apples, the farm’s educational mission ensures that schoolchildren by the busload, Future Farmers of America groups, and grad students from UMass’s Stockbridge School of Agriculture — among others — also come here to learn. “We just want to make people aware of what an apple orchard is, and keep the tradition going,” says farm superintendent Shawn McIntire. Though the question of what an apple orchard is might seem fairly straightforward, in the 23 years since McIntire began working at Cold Spring, commercial orchards have undergone a drastic transformation. On a recent Saturday afternoon, McIntire and technical assistant Kristen Hanley strolled through the orchard, where the history of apple cultivation, and of Cold Spring itself, is written in the trees. UMass had long owned a research orchard in Amherst, but in the early ’60s, that land was earmarked for new dorms. The Massachusetts Fruit Growers Association purchased what is now Cold Spring Orchard in 1961 and donated it to the university the following year, so that research on fruit-growing techniques could continue. The farm is partly funded by the university and partly by fruit sales; all proceeds from the farmstand go into a trust, managed by MFGA, that supports research and outreach. Heading down the slope away from the store — a bare-bones operation with apples in bins and peaches in baskets, cider, honey, and jam put up by Hanley — McIntire points out a few of the older, gnarled trees that, he says, were transplanted from the original research orchard. Others, tidier but still stately, date back 20 years or more. But the newer plantings, here and at most commercial orchards throughout the state, are grown using high-density techniques, with trees planted on dwarf root stocks. These small trees, arrayed in tidy, uniform rows supported by trellises strung between sturdy posts, are increasingly the norm. It’s easy to understand why: “There’s about 40 trees in an acre of the big old standards,” says McIntire. “In the high-density orchard, there are 1,600 to 1,800.” That translates to a lot more fruit. Moreover, it’s easier to pick, lowering labor costs. At the Cold Spring store, just-picked Silkens fill one of the bins. Exquisitely flavorful but a poor keeper, it may not appear in your local supermarket anytime soon. Green table grapes are also on offer — a new-to-Massachusetts variety that has the slip and snap of Concords without the pesky seeds — and Cold Spring extension specialists hope to see them planted more widely across the state. The quest for better fruit proceeds on numerous fronts. Greene notes that the university is in the process of hiring an entomologist, and he’s particularly enthused about a new “weather-based computer decision system,” which can potentially be enlisted to reduce pesticide use. Grad students are exploring everything from battling insects with drones to increasing drainage with daikon radishes.